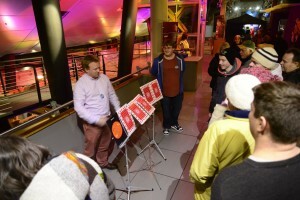 Over 5,500 members of the public joined amateur astronomers, ICG members and colleagues from other local Universities and BBC presenters for the Portsmouth Stargazing Live 2014 event last night. The event, held at the Portsmouth Historic Dockyard in conjunction with the BBC is one of only three nationwide events that BBC Learning are running this week to tie in with the TV show (which is filmed at Jodrell Bank). The Institute of Cosmology and Gravitation at the University of Portsmouth was the main academic partner for the Portsmouth live event. This event builds on the ICG involvement with Stargazing LIVE. 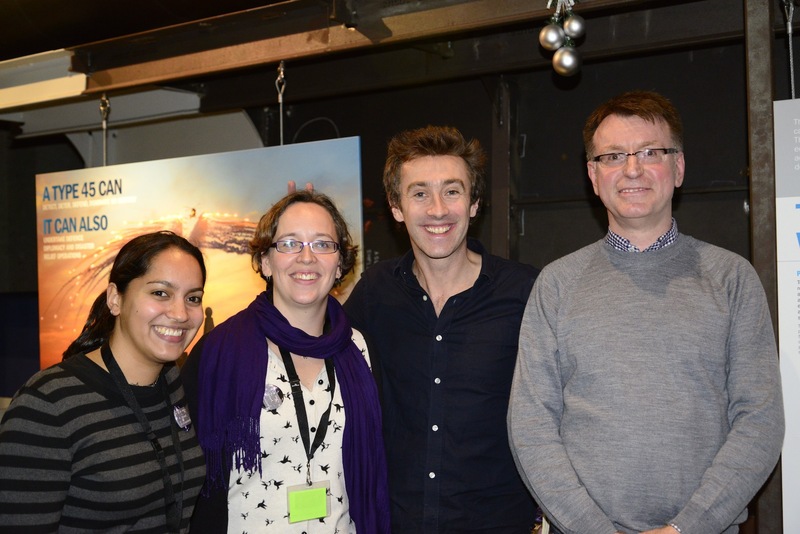 For the third year in a row, lecturers and students from the ICG have offered their time to the public for a free evening of stargazing, space activities and cosmology chat tied into the BBC Stargazing LIVE programme. In 2012 we collaborated with BBC South Learning to run at event at The Spinnaker Tower, while in 2013, the first event held on board HMS Warrior 1860 in the Historic Dockyard was run independently by ICG as a “Partner Event”. This year over 40 staff and students from the University volunteered to help at the event. Bob Nichol, Karen Masters and Jen Gupta of the ICG participated in ‘Top Gear Style’ astronomy conversation with Bang Goes the Theory presenter Dallas Campbell for the ‘Astro-academy’ discussing all things astronomical and taking questions from the audience. 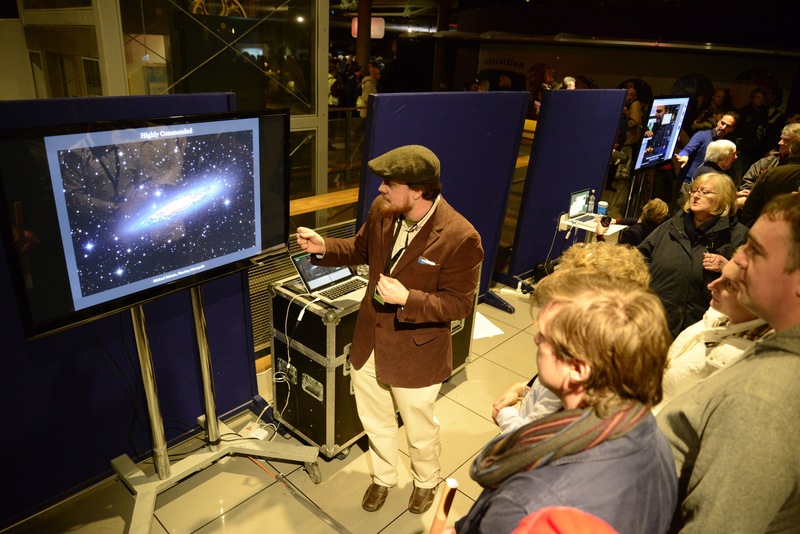 David Bacon, Edd Edmondson, Kazuya Koyama, Matt Pieri, and Ashley Ross explained some of the worlds best astronomical images, as well as discussing their own research in the “Mission Control” area, joined by PhD student Tom Melvin showing off Galaxy Zoo and other Zooniverse projects. Other members of the ICG helped members of the public to test their knowledge, learn how to find their way around the night sky, and learn how cosmologists classify galaxies. This area was organised by ICG Student Outreach Representative, David Wilkinson, and Applied Physics Undergraduate James Bremner helped by many ICG members including Angela Burden, Sandro Ciarlariello, Lodovicco Coccato, Bridget Falck, Christian Fidler, Tim Higgs, Cullan Howlett, Mattthew Hull, Benedict Kalus, Claire Le Cras, Lado Samushia, Oliver Steele, Jimmy Tarr, David Wands and Harry Wilcox as well as several more Applied Physics undergraduates (Lucy Evans, Harry Fox, Jack Mayland, Sam Rahman, Martin Richards, Kate Wyness and Egle Zemaityte). The photos shown here were taken by Marco Bruni. 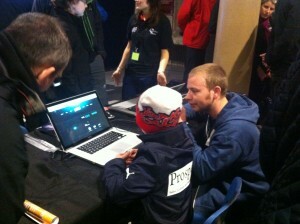 Tom Melvin demonstrates Galaxy Zoo to a younger participant. Jen Gupta, Karen Masters and Bob Nichol with BBC Bang Goes the Theory presenter, Dallas Campbell. ICG staff and students and Applied Physics undergraduates were also joined by staff and pupils from The Portsmouth Grammar School to demonstrate science experiments including demonstrating the colours of stars using coloured gas lamps. Other events on offer last night included the opportunity to learn about how the universe began, train like an astronaut, explore the scale of our solar system, find out how we navigated the seas before modern technology, and look through powerful telescopes on the deck of HMS Warrior 1860. There was also science comedy and music for everyone including a performance from the Portsmouth Military Wives. Here’s the UoP Press release about the event. The Portsmouth News also covered it. Both Jen Gupta and Karen Masters along with many others at the event talked about it on yesterday’s Radio Solent Drive Time with Steve Harris. A short film of highlights from the event (including shots of one of the Astro Academy events with Karen Masters and Jen Gupta) can be seen about 6 minutes into the Wednesday Jan 8th BBC StargazingLIVE TV show. Finally we have made a Storify of all the mentions of the event on Twitter.